Singapore’s best restaurant? Odette would have been one of the top restaurants in Singapore with its 2-Michelin stars accolade and entry on the World’s 50 Best Restaurants. Similar to Jaan, the interior of Odette uses soothing pastel colours along with spacious seats for diners to get comfortable without compromising on dining privacy. The food is memorable, and you have to reserve months ahead to snag a table. As a relatively new restaurant on the list, Preludio impresses us with its elegant monochrome interior, along with its aptly named monochrome theme for its menu this year as well. There are nice pockets of space in the restaurant for couples, where the dining ambience is warm and dim by the evening. The 8-course dinner menu left an impression on us with its unique combination of ingredients and presentation. If dining under the stars is as romantic as it sounds, The Summerhouse brought outdoor dining in Singapore to a whole new level with its air-conditioned inflated sphere. Expect ingredients for the dishes to come from the edible garden on site, while you soak in the cool ambience literally. The interior of Botanico is a harmonious balance of elegance and simplicity, with modern touches from its table wares to the lights, a nice juxtaposition with the colonial feel at first glance. The surprise doesn’t stop here. Walk towards the outdoor dining area and it transformed to an outdoor bar where diners can choose to have their dinner as well. My threshold for heat is low but Botanico has an ingenious solution to combine alfresco dining in a cool setting in Singapore which sounds oxymoronic – there are ample outdoor air conditioning installed at the side walls, sufficient to create that pseudo cool ambience to make alfresco dining a pleasant experience in our tropical climate. For its unique location within Botanic Gardens and reasonable prices, it is a dining destination. 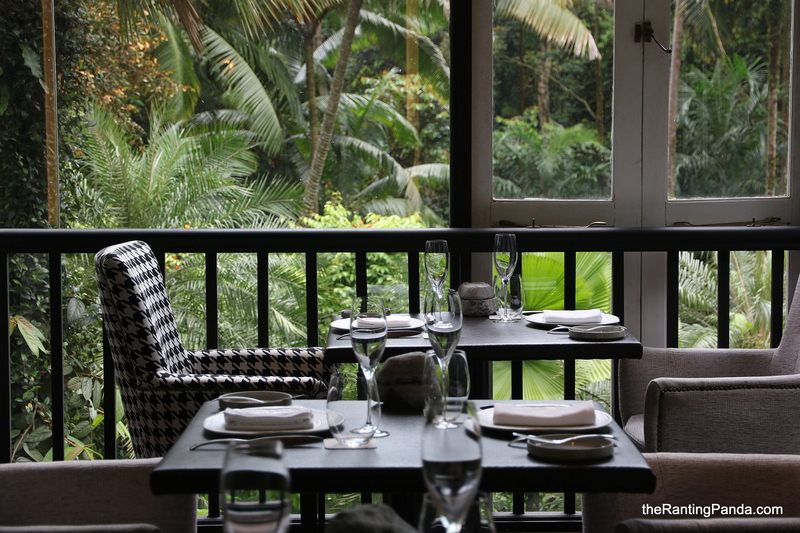 For the closest you can get to a garden setting, Corner House at the Botanical Gardens is worthy of a try. The tip is to request for a table at the Verandah, located at level two of the heritage bungalow which is surrounded by lush greenery of the surroundings. The greenery and space really makes the dining experience a little more special, if I were to compare it to the indoor seats which look like any other restaurant. The view kills at level 55 of Ion Orchard. The high ceiling and spacious setting of Salt Grill & Sky Bar are impressive, while the sunset in the evening and dim setting at night add to the romantic ambience. In terms of food, highlights include seafood dishes and grilled meats. The main draw of Tamarind Hill is its exclusive location, tucked away from the hustle and bustle of the city at Labrador Park. Expect polished Thai food in a 19th century black-&-white bungalow building, in a spacious setting where you can opt for indoor or outdoor dining. We like how the whole restaurant is being conceptualised, right from the entrance which feels like a spa reception, to the naturally lit bar area followed by the dining space.